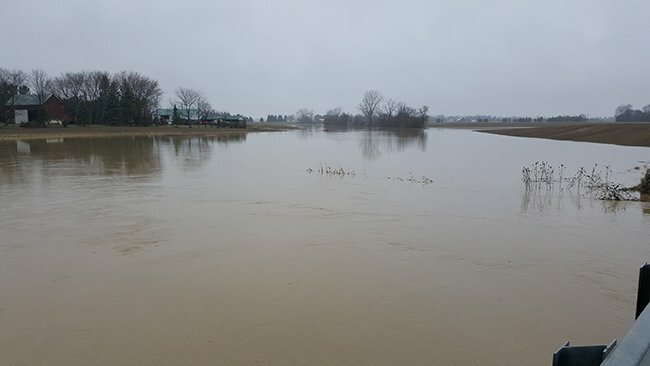 Yesterday, the Lower Thames watershed received rainfall totals between 10 and 50 mm, with the higher amounts received in the western portion of the watershed. There is no significant rainfall in the forecasts for the rest of the week. In the areas that received heavy rainfall, smaller local watercourses saw water levels rise. In some places watercourses reached bank full and some spilled their banks. The Lower Thames Valley Conservation Authority operated the Indian-McGregor Creek Diversion Channel last night. Water levels on these smaller local watercourses have peaked throughout the watershed and are now declining. Water levels on the Thames River will rise over the next few days as the water from the upper watershed make their way downstream. However, flooding from the Thames River is currently not expected. People should take extra caution and avoid the river, ditches, and streams. The combination of slippery banks and fast moving cold water can be dangerous. Standing water can also present its own unseen hazards. Children, pets and livestock should be kept away from the water. Officials will continue to monitor the situation and update this advisory if necessary. A separate advisory will be issued shortly for the Lake Erie shoreline. This message will be in effect until November 20th, 2017.